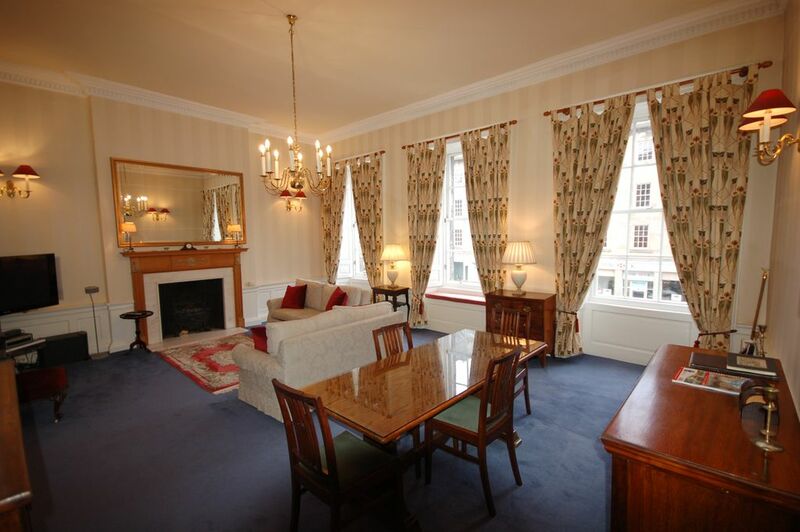 This 4 star rated city centre property is located a 2 minute walk from central Princes Street. It's on the first floor of a Georgian building that was built circa 1790. The property was recently restored and retains many period features yet benefits from a hi-tech spec, including a 43-inch plasma TV and Bose sound system supplying music to every room. The superb triple-windowed Drawing Room overlooks Hanover Street and George Street. This room is furnished with antiques and there are 2 modern comfortable sofas which convert into double beds should guests be staying. Please note if you are using a sofa bed in the living room then the street can be noisy especially at the weekends in the warmer months. We do have the window shutters and thick curtains which help to deaden the noise but if you are a light sleeper then you may want to reconsider. The bedrooms are located to the rear of the building which overlooks buildings and a quiet side street so these are quiet. There is a double and twin bedroom to the rear of the property and both have fitted wardrobes and wall-mounted LCD TV's. The Shower Room has quality fittings and the power shower benefits from body-jets. The kitchen has granite worktops and is well-equipped including a dishwasher, washer/dryer and waste disposal unit. A key to the private gardens is also provided. There is free wifi access. Parking may be available off site upon request for an additional charge. Please note that the fire in the living room is currently non operational. I have been involved with letting out our holiday flat since 1998 when self-catering holiday homes were in their infancy in the city. When I was a student I would do the cleaning to earn me some pocket money, thankfully I don't have to do that anymore! My family bought this property when it was just an unloved office and my parents converted back into a residential home so it has been in our family for over 20 years and we have been operating it as a holiday/vacation let for nearly all that time. Location, location, location - if you want to be in the hustle and bustle of a beautiful historic city with some of the best bars, restaurants and attractions that the city has to offer within a few minutes walk then this is the place for you.. The power shower has 2 wall-mounted body jets. Parking can be made available on request at an additional charge. The parking is located about a 5 minute walk away. A key is provided for the private residents garden at the end of the street. Parking may be made available on request in our private garage. There is an additional charge. excellent located, very well equipped, lovely furniture. Thanks to Francois being our very friendly and helpful host. The apartment was wonderful--centrally located and well appointed. Francois was delightful and helpful. It was a great vacation. Thanks so much! Great place to stay in Edinburgh. Ideal location and very comfortable. Right in the middle of the hustle bustle. Elegant, comfortable and warm. Our second visit. The most wonderful time in Edinburgh at a lovely VRBO!!!! Can’t say enough great things about our stay at this lovely VRBO on Hanover. It was all LOCATION, LOCATION, LOCATION!!! But above and beyond it was an amazing VRBO....had EVERYTHING we needed to have a wonderful stay!!!! It was truly a home away from home and we will definitely be renting from Francois again!!! My family and I miss it already!! Fabulous location and very well appointed. Perfect location and base to explore the city. Close to attractions, restaurants and shops. The Hanover Street apartment is located in the very centre of Edinburgh's Georgian New Town and as such one is perfectly placed for visiting many of Edinburgh's attractions. Edinburgh Castle and the Royal Mile are a 10 minute walk away while the Scottish National Gallery and Portrait Gallery are a 2 minute walk. Edinburgh's fashionable shopping district, George Street is literally on your door step and St Andrew Square, which is where Harvey Nichols is based, is round the corner. This part of the city is crammed with excellent restaurants, bars and pubs and one is only a short walk from theatres, cinemas and concert halls. The city really can cater for all tastes. The rates shown above are an indication of price as this will vary depending on your precise dates, length of stay, group size, special occasions etc. Please contact me for an accurate rate. The rate includes all gas, electricity and taxes. Bed linen and towels are provided and there is no additonal charge for cleaning or laundry. We accept credit cards with a 2% surcharge.